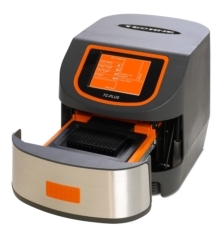 Innovative Techne® TC-PLUS thermal cyclers save time, space and energy! Techne offers the TC-PLUS range of thermal cyclers, a feature-packed combination of Server and Satellite units giving complete flexibility to configure any multi-block format. These versatile thermal cyclers feature some of the fastest aluminium blocks available, providing a ramp rate of up to 5°C per second, as well as innovative energy-saving technology and a space-efficient design. The latest Techne TC-PLUS thermal cyclers incorporate stand-out innovations such as the energy-saving Thermal Energy Recovery System (TERS®) and an automatic non-motorised heated lid. Meeting an important requirement in today's energy-conscious market, the TERS® System achieves reduced operational costs by making vital energy savings, harnessing some of the heat transferred from the block during the cooling phase for re-use in the next heating phase. Almost 15 per cent energy savings can be realized on three-step PCR programs, and around 9 per cent on two-step protocols. The unique front-loading sample drawer uses the force applied to push the drawer closed to lower the heated lid into position with the correct pressure on the sample tubes or plate. Front loading allows units to be stacked without any compromise in function, and front-to-back vented airflow enables close side-by-side positioning, further reducing the bench space taken up. Time savings are an advantage in many research labs and the Techne TC-Plus is the ideal tool for use when optimising protocols for fast PCR, with its flexible programming and rapid block ramp rates. Comparing the same PCR program on the TC-Plus and its simpler predecessor, the TC-512, shows a time saving of around 30 minutes simply due to the faster ramping (1 hour compared with 1 hour 30 minutes), with no appreciable differences in yield or sensitivity between the two thermal cyclers. Further time savings can be made by switching from three-step to two-step PCR cycling, and using fast PCR reagents, when a 40-minute run time is possible. TC-PLUS thermal cyclers and Satellite units provide all the flexibility needed for both fast and high-throughput PCR in research, diagnostics, forensic and testing laboratories. This versatility is enhanced with easily interchangeable blocks, the ability to use any standard PCR consumables and full networking capability for multiple units and optional PC-driven control. The 5.7 inch VGA colour touchscreen with graphical display is intuitive and easy to use, whilst screen buttons are large enough for gloved fingers to use easily. At least 1,000 programs can be stored and the front-positioned USB port makes it easy to transfer protocols between cyclers or laboratories, and archive run log files. Three easily interchangeable blocks - 96 x 0.2ml, 60 x 0.5ml and 384-well microtitre plate - all have a temperature gradient option (up to 30°C) for efficient optimisation of PCR conditions. These relatively massive blocks deliver greater uniformity and thus more reproducible PCR results than a thin silver block. The USB connection and PC software option enable multiple TC-PLUS cyclers and Satellites to be networked easily, for high throughput PCR using 96-well or 384-well blocks. Satellite units can be controlled from the TC-PLUS server or from a PC with the Workbench software but have no individual user interface. A leading supplier with over 20 years experience in the design and manufacture of thermal cyclers, Techne offers the TC-PLUS with an industry leading 4-year warranty (4 years or 100,000 temperature cycles for blocks).